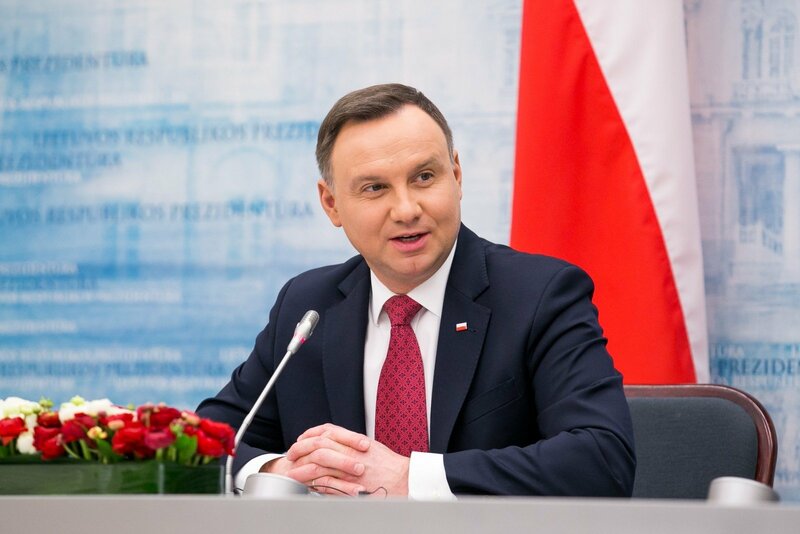 After the Polish President Andrzej Duda's visit to Lithuania, which ended this weekend, talks have begun about warming relations between the two states, LRT.lt writes. The Lithuanian president declared that she would not support potential European Union sanctions against Poland, with the risk of the Union choosing to even vote on freezing Poland's right to vote. Are the relations warming? And if yes, at whose expense? This was discussed on the LRT Television talk show Dėmesio Centre with the president's chief advisor, foreign policy group head Nerijus Aleksiejūnas, signatory jurist Česlavas Okinčicas and Vytautas Magnus University Political Science Department head Andžej Pukšto. It was observed that the Polish president's statements were fairly neutral, with no criticisms levied against Lithuania, however certain signals during the visit are ambiguous, such as the meeting with Valdemar Tomaševski and how during the president's visit to Rasos Cemetery, A. Duda placed a wreath at Jozef Pilsudski's heart grave, but paid no attention to the grave of Jonas Basanavičius, which was just nearby. In the context of the Lithuanian independence centenary, leaving at least some flowers at J. Basanavičius' grave could have been symbolic. A. Pukšto agrees with this, noting that there were both positive and negative signs during the visit, such as the meeting with V. Tomaševski, which according to the political scientist left an unpleasant odour. Furthermore he observes that earlier there was a tradition that Polish politicians would place flowers for J. Pilsudski and would at the same time visit J. Basanavičius' grave. 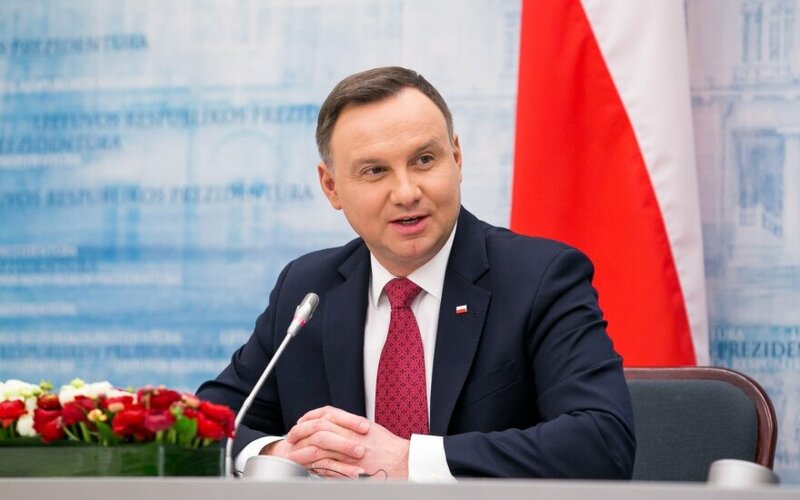 Nevertheless the political scientist observes that there were positive signs, with A. Duda' visit lasting three days, which is atypically lengthy. In terms of A. Duda's meeting with W. Tomaševski, who is a controversial figure due to his pro-Russian stance, Č. Okinčicas agrees that it was not a positive signal, however on the other hand he points out that A. Duda and W. Tomaševski worked in the same group in the European Parliament for a lengthy period, which may have led to such a meeting. Even then, the jurist points out that from the president's statements following the meeting, what he may have heard from W. Tomaševski did not reflect in A. Duda's public statements. N. Aleksiejūnas plays down the significance of whatever signals may have been sent throughout the visit, pointing out that in the first place, it is very important that this was the first visit by a Polish president in five years and it lasted three days, with the last such visit having possibly been Lech Kaczynski's last visit. "You could find various symbols, but we were most interested in the content. Almost half a year of work was put into the visit, if not an entire year and a half. I myself visited Warsaw, had meetings with A. Duda's advisors. As such, the visit was certainly prepared and I believe the successful results are proof of this. We signed an agreement over the border with Poland. We do not sign anything with Poland that often because it would appear that all is said and done, but in fact, we have found things that can be presented as very concrete results. We spoke on security and energy projects that are the most important to us," the president's advisor said. Certain Polish figures in Lithuania received the Polish president's visit fairly negatively, with for example Renata Cytacka, who belongs to W. Tomaševski's environment criticising the Polish president's statement that Lithuanian Poles should learn the state language and that Polish children should attend the Lithuanian language exams and such. A. Pukšto explains that this is related to certain politicians' specialisation, with many profiting from poor relations between Poland and Lithuania, not just among the Electoral Action of Poles, but also among some Lithuanian politicians, with radicals "feeding" off of the conflict. "If the two states' relations improve, such politicians lose a certain part of their activities. I would think that we will hear a number of voices of outrage over February and March," the signatory stated. As for the Lithuanian president's statement that Lithuania will not support any forcible measures against Poland in the current conflict between the European Commission and the Polish government, Č. Okinčicas observes that Lithuania is a strong state in the EU context, with the Lithuanian president being well known in Brussels, having worked there for an extensive period of time and being familiar with the inner workings there. "Lithuania has already displayed leadership once when a new EU agreement was being prepared and then Lithuania was a sort of mediator between the EU and Poland. Back then, the work was done by President Valdas Adamkus. I believe that now is exactly a good moment for Lithuania to take an active position in negotiations between the EU and Poland. It is an excellent opportunity for Lithuania to show that we are certainly strategic partners and that Lithuania can be beneficial to both sides. The EU will only benefit from it," he pointed out. In this respect, N. Aleksiejūnas adds that on the eve of February 16, the Lithuanian president and European Commission President Jean-Claude Juncker had a dinner, during which the issues with Poland were brought up. During the discussions over dinner, it was expressed that the European Commission would also prefer to resolve matters through dialogue, rather than any forcible measures or sanctions. Č. Okinčicas notes that relations between Lithuania and Poland shifted immediately on A. Duda's election, with the new Polish president declaring in one of his first interviews that he would strive to open a new page in Lithuanian-Polish relations. Further steps and visits underlined this, with then Vice Prime Minister Mateusz Morawiecki immediately visiting Lithuania, after which followed a visit from the Polish parliament speaker and also with Lithuanian reciprocal visits to Poland. "Everything was being done so that at a very good time, on the Lithuanian independence centenary, President A. Duda would visit. It was certainly a major feat by our diplomatic corps and president. I believe that the results definitely yield positive hope," he noted. Nevertheless, difficult issues remain, such as the writing of surnames in personal documents, with the issue having remained on the table for the past ten years. N. Aleksiejūnas explains that while this was not the main topic of this visit, it was touched upon, as were education issues. In response, the Lithuanian president proposed to gather experts to gather facts and data, to coordinate the two states' perceptions of the situations. It was proposed to renew the education commission, which operated up to 2011. When asked if it is possible to develop relations after not upholding promises in decades, A. Pukšto states that, "You know, everything would be easy if it wasn't hard. Firstly, I want to return a little to the question of the European Commission. We must not forget that in essence the Lithuanian and Polish majorities' vision of the EU and views of it diverged greatly. Lithuania is more in favour of an integrated European Union, for a more interrelated EU, while the current Polish majority has a somewhat different vision. Poland believes that member states should retain more decision making power. This must be kept in mind. However, if Lithuania succeeded in moderating and now is a good time for it, we would certainly benefit. As for domestic policy and our promises to Poland, it is worth noting that even before there were many meetings at the highest levels, but no steps were made. One matter is the façade and a whole other is the real homework. What is important now is whether the homework gets completed or not."